Wash, rinse, then soak barley in cold water. Let stand for 30 minutes while preparing other ingredients, then drain. Boil water and barley in a medium saucepan, and salt to taste; simmer uncovered for 12 minutes or until tender. Drain. Melt butter with oil in a large skillet over medium heat. Toss in the leeks, stirring frequently for 2 to 3 minutes. Add mushrooms, garlic, salt and pepper, stirring occasionally for about 5 minutes. Add wine and simmer 2 minutes. Stir in barley and let cool completely. Mix in crème fraiche, gruyere, parsley. Salt and pepper to taste. Cut and roll out puff pastry to 1/8 inch thickness. Cut into circles slightly larger than the tops of ramekins. Set aside pastry on parchment. 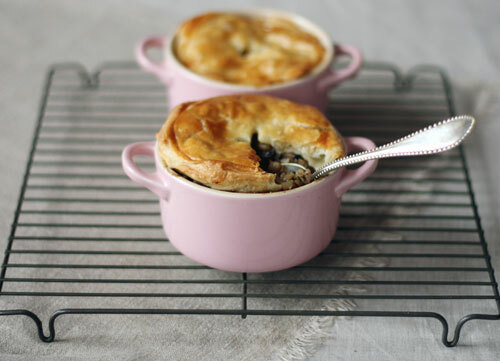 Fill ramekins with cooled mushroom mixture, leaving space at the top. Place dough over mixture and make a few slashes over the top to allow steam to escape. Combine egg, salt, and water in a small bowl. Brush pastry with egg mixture. Bake until puffed and deep golden brown, about 30 minutes.